Nothing much planned to do in Washington but lots to see. Liam and I started the day with a bike ride, we went past the US Capitol, Washington Monument, DC War Memorial, Lincoln Memorial and decided to head back to Union Station. As we were traveling the President's Motorcade went past, bit exciting although we were too far away to take any photos. I'm not sure it was him but I will say it was. Apparently the President's motorcade is the only one that travels with an Ambulance. We then stumbled upon the White House, totally different to what and where I thought it would be but Liam and I were very excited. We then met up with Dylan at Union Station and had Shake Shack for lunch. We definitely need one of these in Australia. The shops are made out of reuseable materials, the table tops were made from recycled bowling allies. The food was organic, fair trade etc and yummo. And because we hadn't done enough yesterday we then did some more shopping, headed back to the room for a rest and booked a Segway tour for that evening. 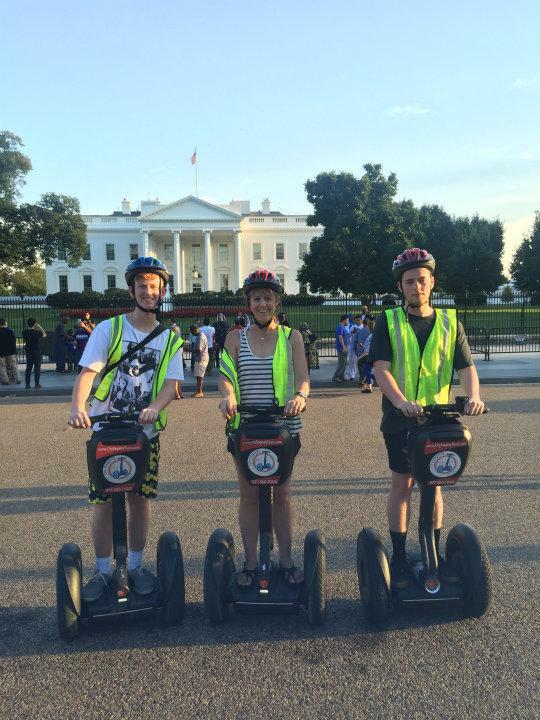 What can I say about the Segway tour but fun fun fun. The best way to get around all the monuments which are a long distance in between. If we walked the tour it would take us all day so 3 hours on a Segway was the best way to do them and we picked the best time of the day. It was very hot so going around in the cool of the night was perfect. The boys loved it as much as I did and I would definitely do it again. By the time we finished it was 9pm and we hadn't had anything to eat. We found a Whole Food place in Foggy Bottom (the name of the suburb lol). Gee Australia, we need one of these also. Everything was freshly made and it had a supermarket at the bottom that sold all natural stuff. The food you order was sandwiches, pizza, burgers, curries, soups and on and on it went. The day ended with us totally exhausted but we had had loads of fun.